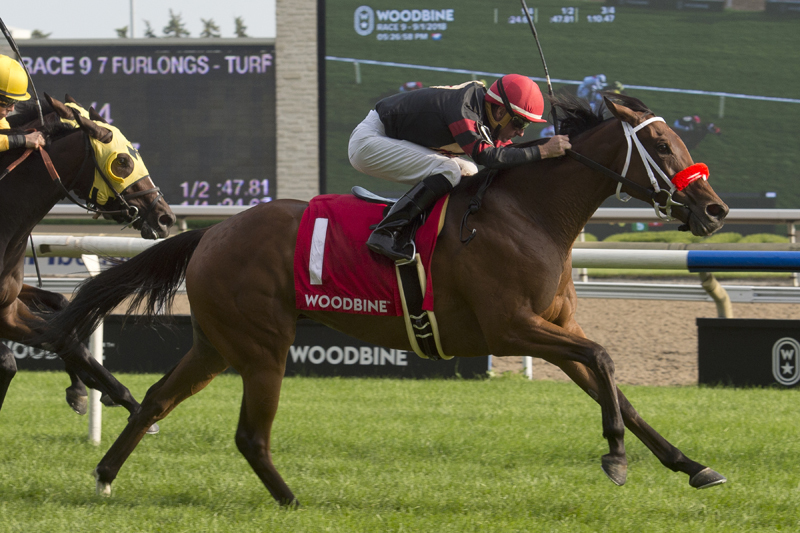 Stronach Stables’ popular filly Zestina made a late run in the stretch to earn her first stakes victory in the $100,000 Passing Mood over Woodbine’s E.P. Taylor Turf Course on Saturday afternoon. The seven-furlong Passing Mood is for Ontario-sired three-year-old fillies. With Gary Boulanger aboard, Zestina tracked in fifth-place throughout then fanned out wide off the final turn and overtook the front-runners down the stretch to win in 1:22.84 over firm turf. The Sid Attard trainee hauled down the drifting race leader Without a Doubt (:24.67, :47.81) and the rail-skimming Silent Respect, who held on in a show photo over late-closer Line of Vision. Boulanger was confident heading into today’s test with the favoured filly who was a winner two starts ago over 6-1/2 furlongs on the turf. Bred by Adena Springs, the Silent Name-Spun Lace filly is now a three-time winner and has conquered both the turf and Tapeta surfaces at Woodbine. She has finished no worse than third in her seven races lifetime. “She’s such a nice filly, she doesn’t mind running anywhere, but I think she likes the grass a little better,” said Attard, who has campaigned two previous winners of the Passing Mood (Generous Touch in 2016 and Arctic Laur in 2006). Sent postward as the 6-5 bettors’ choice, Zestina delivered on her pari-mutuel promise and returned $4.40, $2.70 and $2.20 at the betting windows. Without a Doubt ($5.70, $3.40) completed the exacta worth $21.50 while Silent Respect ($3.60) rounded out the trifecta, which returned $33.20 for a $1 ticket. With Line of Vision third, the superfecta paid $98.80 for a $1 ticket. Gosudarina, She’s Got Fire and Airy Fairy finished fifth through seventh. Live Thoroughbred racing continues at Woodbine on Sunday afternoon, featuring the $100,000 Ontario Jockey Club Stakes. The first of 10 races goes to post at 1 p.m.